Discover out-of-the-way places like Ecola State Park and Astoria Column. Step out of the city life by going to Cannon Beach and Haystack Rock. 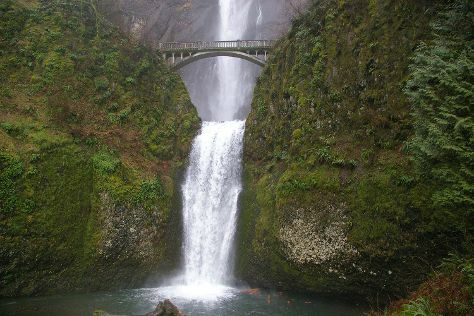 Get out of town with these interesting Portland side-trips: Beach Books (in Seaside), Multnomah Falls (in Bridal Veil) and Hood River Lavender (in Hood River). It doesn't end there: contemplate the waterfront views at Columbia River Gorge National Scenic Area and admire the natural beauty at International Rose Test Garden. For other places to visit, photos, maps, and tourist information, read our Portland planner . New York City to Portland is an approximately 8.5-hour flight. You can also do a combination of train and flight; or drive. The time zone changes from Eastern Standard Time to Pacific Standard Time, which is usually a -3 hour difference. Plan for little chillier nights when traveling from New York City in July since evenings lows in Portland dip to 59°F. Finish your sightseeing early on the 14th (Sat) so you can travel to Paris. 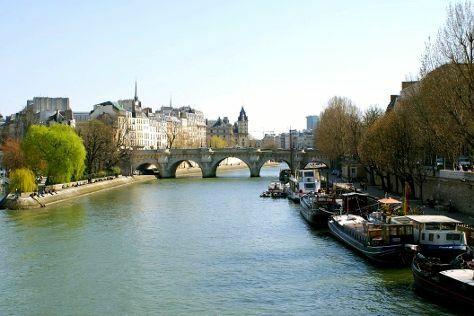 Start off your visit on the 15th (Sun): shop like a local with Le Marais, stroll the grounds of Père Lachaise Cemetery, then tour the pleasant surroundings at Ile Saint-Louis, and finally head off the coast to Île de la Cité. Get ready for a full day of sightseeing on the 16th (Mon): take in the architecture and atmosphere at Chapel of Our Lady of the Miraculous Medal, wander the streets of Saint Germain des Pres Quarter, and then enjoy the sand and surf at Paris Plage. To see maps, where to stay, ratings, and tourist information, use the Paris trip itinerary planner . Fly from Portland to Paris in 16 hours. Alternatively, you can do a combination of train, bus, and flight. Traveling from Portland to Paris, you'll lose 9 hours due to the time zone difference. In July, daily temperatures in Paris can reach 78°F, while at night they dip to 59°F. Finish up your sightseeing early on the 16th (Mon) so you can catch the train to Lyon. Kick off your visit on the 17th (Tue): take in the architecture and atmosphere at Eglise Saint Nizier, explore the ancient world of Théâtre gallo-romain, and then contemplate the long history of Cite medievale de Perouges. 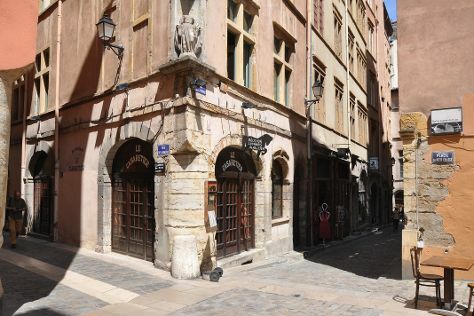 On your second day here, get to know the fascinating history of Fourviere Hill, pause for some serene contemplation at Eglise Saint Georges, and then appreciate the extensive heritage of Vieux Lyon. Plan my Lyon trip by asking Inpirock to come up with tips and suggestions. You can take a train from Paris to Lyon in 2 hours. Other options are to fly; or drive. In July, daily temperatures in Lyon can reach 81°F, while at night they dip to 63°F. Wrap up your sightseeing on the 18th (Wed) to allow time to drive to Turin. Visit Sacra di San Michele and Santuario di Oropa for their historical value. Take a break from the city and head to Lillaz Waterfalls and Zoom Torino. Change things up with a short trip to La Venaria Reale in Venaria Reale (about 38 minutes away). The adventure continues: contemplate the long history of Basilica di Superga, admire all the interesting features of Juventus Stadium, and don't miss a visit to Piazza San Carlo. For maps, ratings, more things to do, and other tourist information, you can read our Turin day trip website . You can drive from Lyon to Turin in 3.5 hours. Alternatively, you can take a bus; or take a train. Expect somewhat warmer evenings in Turin when traveling from Lyon in July, with lows around 71°F. Wrap up your sightseeing on the 21st (Sat) early enough to drive to Geneva. 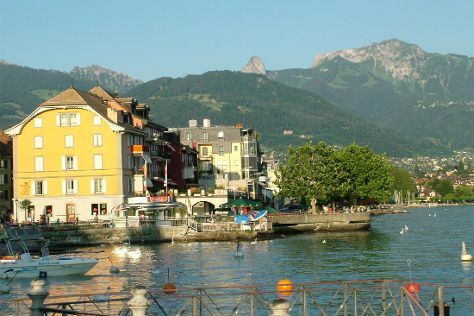 Kick off your visit on the 22nd (Sun): explore the activities along Lake Geneva. Get ready for a full day of sightseeing on the 23rd (Mon): look for gifts at Davidoff, take some stellar pictures from St Pierre Cathedral, then admire the local landmark of The Geneva Water Fountain, and finally tour the pleasant surroundings at Plage de Port-Choiseul. To find where to stay, traveler tips, other places to visit, and other tourist information, you can read our Geneva tour itinerary planning app . Drive from Turin to Geneva in 3 hours. Alternatively, you can take a bus; or take a train. Traveling from Turin in July, you can expect nighttime temperatures to be little chillier in Geneva, with lows of 59°F. Finish your sightseeing early on the 23rd (Mon) to allow enough time to travel back home.